The effect editor is a docking pane used to edit the features of the effects. There are various controls that are highly intuitive to control the values of the effects. The docking pane can be docked in any of the normal docking places or can float as a undocked window. Properties of the effect are divided up into collapsable categories. Most of these categories are consistent across all the effects. This will help you find similar features across the multitude of effects as you become familiar with them. The label for each property has some hover text that gives a better description of what the property changes or how it may act. The editing is done in a live mode. All changes take effect once the adjustment settles for a short period of time. The effect will be rendered and the new representation will show in the timeline. More than one effect can be edited at the same time. Each property will be applied to each effect edited. The effect do not even have to be the same kind. Some properties may not support multiple editing depending on their function, or if all effects do not have that property and will not be shown. The sliders control items that have ranges. Check boxes for on off type options. Combo boxes for items that have specific selections. Text boxes for other values that need text or have specific values that are beyond the resolution of a slider. The text boxes themselves have a bit of a slider function built in for numeric values. When you hover you mouse just below one the cursor will turn to a cross. At that point you can click and drag left and right below the text box to quickly alter the value up or down. There are image representations for Colors, Curves and Gradients. When double clicked, these will open the appropriate editor for each type. These also serve as drag n’ drop zones to drag that item out to somewhere else in the editor or another one dragged into to be used as the setting. They can be dragged onto other effects in the timeline or into their respective library to add them to the library. These same items can be dragged from the libraries onto the type in the editor to change them. See the drag/drop section for more details. They can even be dragged across two open sequences in two different editors. 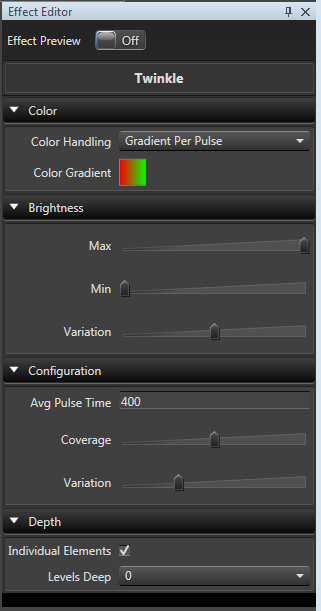 In addition to double clicking the Color Gradients or Curve editor images to bring up the large full editors, both can be edited inline directly inline in a similar fashion as they can be edited in the larger editors. Most of the same actions work the same. Many of these options will change based on selections you make. Options that are not relevant to a specific configuration will be hidden. Lastly there is an option to turn on the live preview at the top. This will enable previewing of just the selected effects in the preview window if you have it running. This way you can preview the changes to specific effects without having to play the sequence.